Taoyuan, TAIWAN – July 26, 2010 – HTC Corporation, a global designer of smartphones, today introduced Super LCD display (SLCD) technology into a variety of HTC phones including the HTC Desire and global Nexus One later this summer. The SLCD display offers an exceptional natural balanced colour, clear contrast, broad viewing angles and improved power efficiency. "HTC is experiencing high-demand for many of our phones, specifically our phones with 3.7 inch displays. The new SLCD display technology enables us to ramp up our production capabilities quickly to meet the high-demand," said Peter Chou, CEO of HTC Corporation. "The SLCD displays provide consumers with a comparable visual experience to HTC's current 3.7 inch displays with some additional benefits including battery performance." SLCD is the latest generation of LCD technology that offers improved performance from earlier LCD panels including approximately five times better power management. SLCDs also offer an enhanced viewing experience with wider viewing angles that are enabled by Sony's new VSPEC III™ technology. It sounds like Samsung refused (or was unable) to ramp up AMOLED deliveries, and HTC was forced to go elsewhere for its displays. 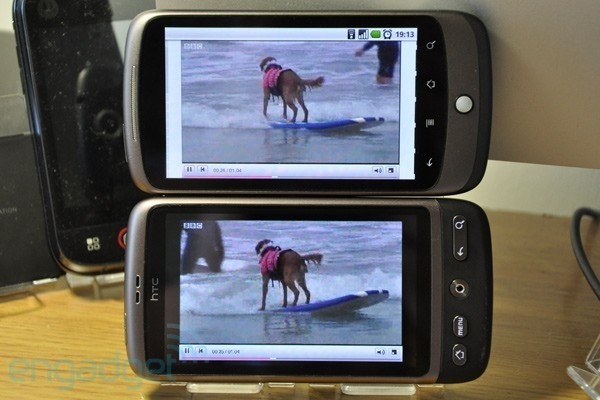 Given the history of HTC with AMOLEDs, this certainly was considered a possible course of action. Claims of increased battery life in these SLCDs have yet to be evaluated, but given the intense brightness of AMOLED displays, I wouldn’t be amazed if it were true. A less concrete conclusion can also be drawn from this press release in regards to a certain unmentioned phone: the Incredible, which uses the same display as both the Nexus One and Desire. Could the Incredible be on the chopping block? Or is HTC using the few AMOLED displays it has to ensure the Incredible continues to ship? Let us know your thoughts below!